In the late l980’s, Butler’s writing and activism refocused on women’s health after her partner, Barbara Rosenblum, was diagnosed with terminal breast cancer. 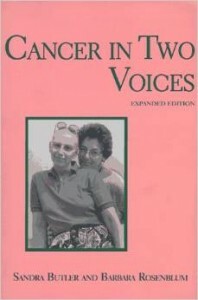 Together they wrote Cancer In Two Voices, published in l988, the year of Barbara’s death. The book received the Lambda Literary Award for Lesbian Non-Fiction and continues to be a widely read resource for those who face life threatening illness and the partners who love them. Available from a variety of sellers on Amazon.com.